As it turns out, there are no ifs in Washington, DC either. She did return home, and her life, both personal and professional, became forever intertwined with the Post. Miss Meyer became Mrs. Graham, the wife of Philip, a brilliant Floridian with an interest in politics who worked as a law clerk for the Supreme Court. Despite his lack of experience in journalism, he succeeded his father-in-law as the Post’s publisher, helping to grow the paper’s profitability and influence; upon his death (a suicide) in 1963 Katharine succeeded him, as publisher and later Chairman of the Board, guiding the Post through many of its defining moments, including Watergate. 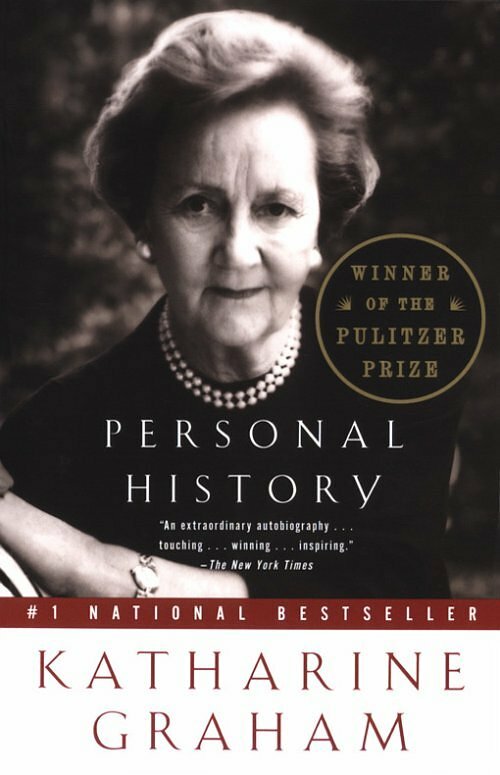 I adore Katharine Graham’s autobiography Personal History. I first absorbed the story of her unlikely rise to the role of publisher the summer following my freshman year of college. Her Pulitzer Prize-winning work has since become an old friend. I’ve re-read it on trains, in the bathtub, and during lunch breaks. The book has accompanied me to Bermuda, Spain, Morocco, France, and various parts of the United States. I’ve often found myself thinking about the significance of the anecdote mentioned above. Why include it in the book? There is not any indication in Personal History that Katharine harbored any regrets about leaving California or the life she built in Washington, DC. The incident, in my opinion, speaks to the importance of choices. Indeed, she was. She was more than enough, as her steadfastness in the face of personal and professional obstacles proved. She silenced the doubters, including herself. While I suspect ultimately she would have arrived at the same sense of self-empowerment if she remained in California, her choices certainly shaped her legacy. There are no ifs in California, no ifs in DC, and no ifs in life. Instead, there are choices that we make and own and the faith we possess that we’re doing our best. Lately I’ve been attempting to open myself to new experiences and making more conscientious, if small, choices. Nothing life altering (not yet), but I’m trying to be less passive and take more ownership over the events and emotions that impact me. There’s a famous Maya Angelou quote that addresses choices and change: “If you don’t like something, change it. If you can’t change it, change your attitude. Don’t complain.” I’m slowly figuring out what this means to me in the context of my own life. During this time of rebirth and renewal, may we all realize we’re enough and embrace the blessings and/or consequences of our choices. I suspect this post will undergo numerous revisions. After all, it’s a story that’s still being written.